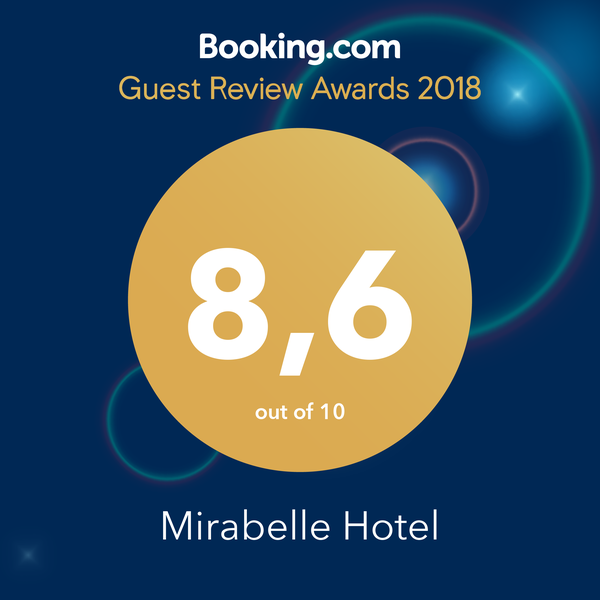 As soon as you arrive at Mirabelle Hotel you will embark on an experience different from that of a huge and cold urban building with multiple floors and adjacent rooms. Instead you will see a miniature of a traditional Greek village on a hill, under the warm sunlight, and with a breathtaking view of the sea. Our rooms are scattered harmoniously in the picturesque environment comprised by a beautiful garden, paved paths, and balconies, some of which face the small nearby church. 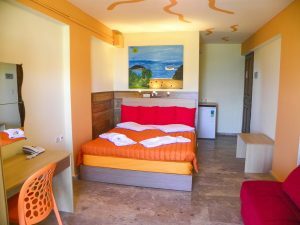 Every room’s arrangement and decoration help our guests feel comfortable on their vacation by the sea, enjoy their sleep in their chosen quality mattress and escape from the urban routine. After experiencing the colors, harmonious smells, and items of the room, our guests encounter a new set of feelings once they go to the balcony of their room. They will face the limitless blue of the sea and the sky while enjoying the warm sun, talking with their neighbours, reading a book, watching little kids playing at the garden or diving in our pool, surfing on the internet, or tasting delicious Greek dishes, desserts, and wines. 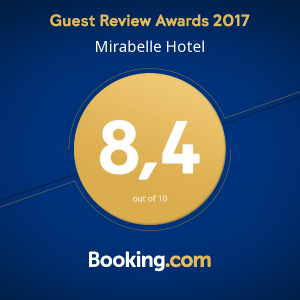 Mirabelle Hotel is a traditional architectural complex of 3 buildings on the ground and first floor. 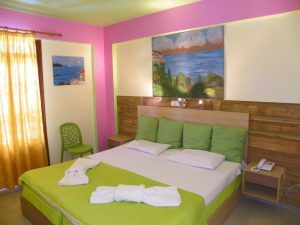 has 18 Standard & 9 studio rooms. Our breakfast never fails to pair the abundance of tastes and aromas with the values of simplicity, clarity and purity. We provide quality and great variety with many changes every day. Our guests can enjoy food from the 10m buffet (Greek – American – English) breakfast daily from 8:00 am to 10:00 am. We are proud to be selected to participate in the Greek Breakfast national program. The delicious hearty buffet includes delicacies from the international and local cuisine, as well as energy-boosting, yet healthier choices: scrambled – boiled – omelet – fried eggs, bacon, sausages, fresh fruits, fruit compote, cakes, waffles, pastries, many types of bread, rusks, bagels, croissant, brioche cookies, tarts, cereals and bars, yogurt, jams, hazelnut praline, honey, cheese and ham selections, smoked turkey, salads, pickles, fresh juices, and, of course, coffee, milk, chocolate milk and tea. Gluten, lactose free and vegetarian options are also available upon request. Everything is made with fresh ingredients and prepared by special attention. 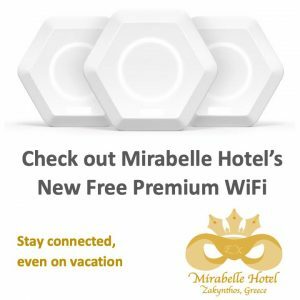 The breathtaking view of the Ionian Sea of most of our rooms, the tranquility and safety of the area, and the easy access to every attraction of the island make the location of our hotel ideal. Guests can hear the waves of the sea from their balcony. 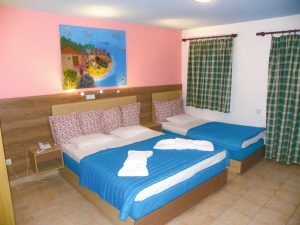 Guests can also visit on foot the nearby public beach, the bus station, many restaurants, a pharmacy, mini-market, the tourist agencies and markets, car rentals and any kind of entertainment attraction that they seek. 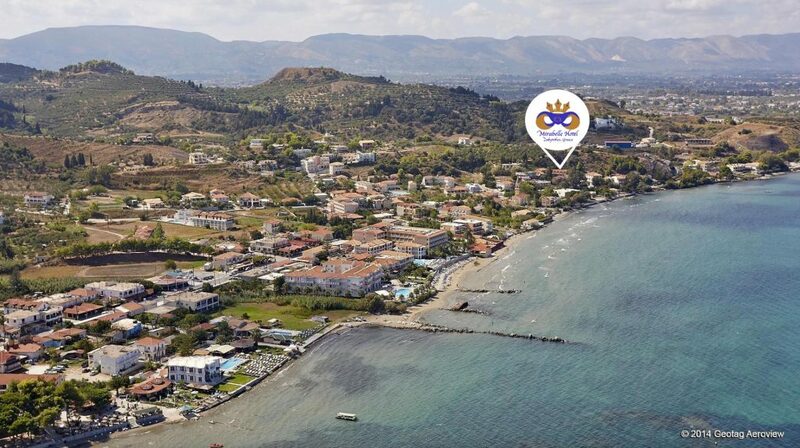 Our location gives easy access to the port, airport, downtown, the most beautiful beaches of the island, watersports and diving activities, horse-riding, the National Marine park, the famous Shipwreck, and the hospital. Zakynthos is a fascinating destination. Our central yet quiet location enables guests acquire unique and exciting experiences.